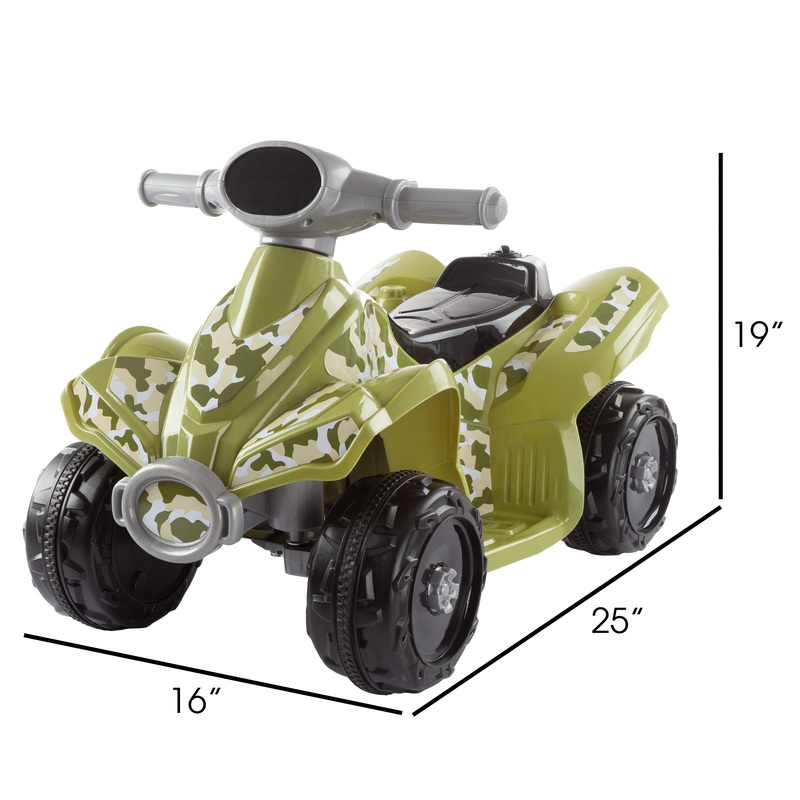 Your little ones will be ready to hit the trails with the Ride-On 4-Wheeler ATV by Lil’ Rider. This toy electric ATV has a maximum speed of 2 miles per hour and only moves forward, so your kids will travel at a safe speed. The handlebars have a simple push button to start up the 4-wheeler so it’s easy for little ones to ride and play. With the included 6-volt rechargeable battery and electric motor, your little boy or girl can zoom around the house or backyard for hours of fun. 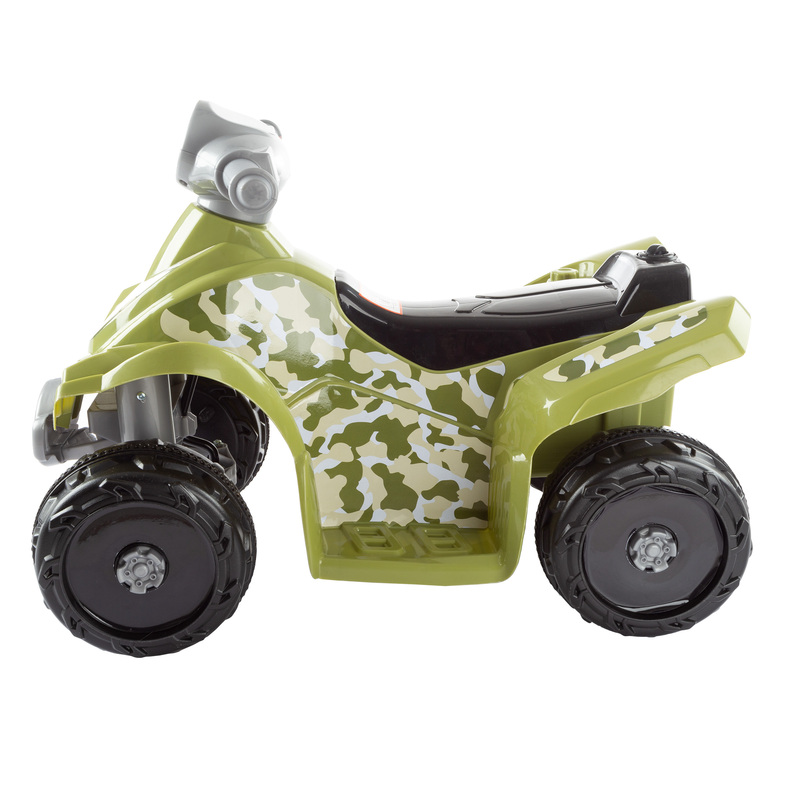 The green camouflage design gives this ride-on toy a rugged look, so kids can pretend they’re driving down forest trails and having off-road adventures. USE IT ANYWHERE –Perfect for both outdoor AND indoor playing and can easily be used on any hard, flat surface. It’s also lightweight and features a compact design for easy transport around the yard or even to the park! EASY TO RIDE – The 4-wheel designed ATV is smooth and simple to ride for your children aged 2 to 4. Charge the battery according to the included instruction manual- then simply just turn it on, press the button, and go! SAFE AND DURABLE – The ATV has a maximum forward-only speed of 2 MPH, so your little ones won’t be in danger of taking spills or crashing too hard. It features a sturdy plastic and metal construction to handle both indoor and outdoor play. 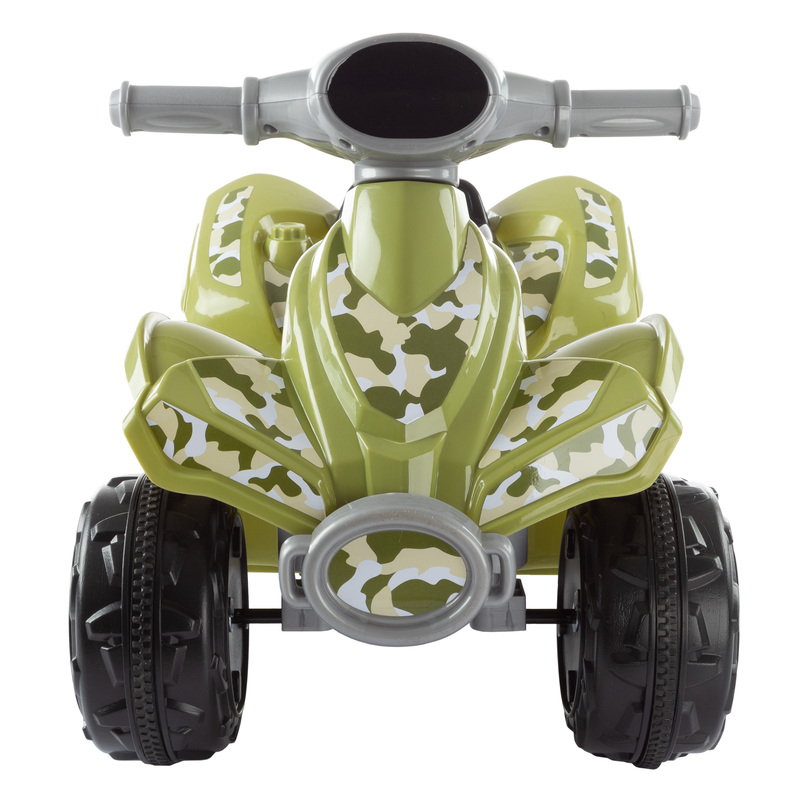 RUGGED LOOK – This battery-operated ATV features a green camouflage design. 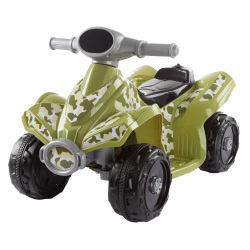 This gives the ride-on toy a rugged look, so your little ones can pretend to have off-road and backwoods adventures as they drive around the backyard or their playroom. PRODUCT DETAILS- Materials: Plastic and Metal. Battery: 6 Volts. Color: Green Camouflage. Maximum Forward-Only Speed: 2 Miles Per Hour. Dimensions: 25” L x 19” H x 16” W. Includes Battery Charger.